I have now come to the final book of Jason Reynolds’ Track series. 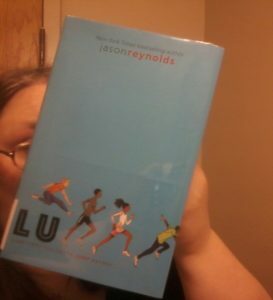 Lu Track #4 covers the last leg of Ghost, Patina, Sunny and Lu during their time as newbies on a middle-school track and field team. It is bittersweet as I would like to know more, but also it is time to come to the finish line. We follow Lu as his changes include not being a full-time runner but is also doing the hurdles (which, of course, is a metaphor for his life), learning about his father’s past, his mother’s surprise pregnancy, overcoming bullies and fears he has. Not to mention the day-to-day issues of being an albino. Yet, Lu, while having self-confidence issues, also has a good hold on who he is. That is, until he starts to have the changes occur and he redefines himself. As I was reading Lu I started to realize it was like another group of friends made up of three boys and a girl. Track is like James Howe’s The Misfits series. Not just because of the gender parallel, but the fact these four kids’ stories need to be told in the order they were, their coming of age story is relevant anytime, and you needed to build up to the final one. Like Totally Joe had to end The Misfits, Lu had to be the last book as his story ties it all together. Take notes in the first three books as everyone finally comes together to show you the community and how family is not always the people you are born to, but also, can be. Even though I have enjoyed Track, I was wondering how it would end. Each book before has ended before the races results. But this time, this is it. There was going to be no book five. And while the ending probably was the only possible ending, this reader is disappointed. No spoilers, but I thought there could have been a way to show the “family being there for you” and the race differently.